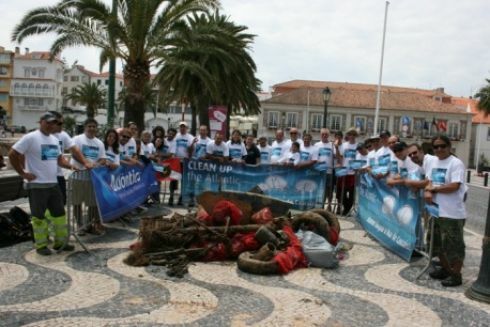 Clean up the Atlantic is a seabed cleaning performed once a year in Cascais Bay, which has an accumulation of marine litter, partly due to the fishing port activities. This initiative is open to all volunteers with experience in diving. The rest of the public can also participate by helping divers in the transport of waste to the beach. The waste is weighed and exposed for a few hours in the Cascais Bay in order to raise awareness to the general public about marine litter. Before each annual action, an informative session is held with both of the fishermen's associations existing in the Municipality. On the clean-up day, the fishing community provides one boat to transport the waste collected by divers to land. In past editions, collected objects included shoes, car batteries, shopping carts and baby carts, radios, glass shelves, traffic signals, anchors and various pots and fishing nets. Seven tonnes of garbage have been removed from Cascais Bay as a result of this initiative.